We spent days painting it and (in our teenage minds) it was a masterpiece. Using a 1980s overhead projector and a transparency picture of clip-art Jesus, a few friends of mine and I traced and painted a floor-to-ceiling image of Christ for the youth group room. Including one arm stretched forward, He stood with a finger pointing right at the viewer. At the bottom of the mural was the caption, “Count the Cost,” serving as the foundation for the artist’s message. So, there He was. Jesus. Staring at me, indifferent to my desires (so I thought), unknowing of my moments (at least, I hoped He was! ), yet demanding obedience in my days. I didn’t know exactly what it meant to count the cost, but I could tell it had something to do with changing my ways. I certainly didn’t recognize that the saying was inspired from Scripture. But as I stood glaring at the portrait we had completed, I wondered what this pointing Christ was thinking of me. Does he really know who I am? Can he truly see into my heart? If so, is he disappointed with me? What does it mean to count the cost? The word surrender has the power to initiate in me a skedaddle sequence. I love control and the thought of giving it up is not naturally an attractive option. Deep down, surrender echoes images of failure — of giving up and giving in. A last resort. A desperate, arm-twisted-behind-my-back-cry of relent, “OK! OK! Enough!” But surrender doesn’t have to be a scary setback, a proof of failure. Relinquishing control can be a joy-filled sprint toward the greatest victory. It all depends on whom I surrender to. These days, letting go of control often means being okay with the disaster area that is my house. On any given day you’ll find crumb-laden floors, finger smudged mirrors, dirty toilets, and all the mis-matched socks laying all over the house. To give you a bit of perspective, I was the type to dot the bottom of of my socks with different nail polish colors so I could more easily find the pairs. Decades later, with a husband and three kids in the mix, you might say I’ve thrown the baby out with the bathwater. Dozens of mis-matched socks lurk on the floors, under couches and beds—or wherever they all disappear to. The pursuit of keeping socks perfectly matched had to end. I chose to surrender to sanity. 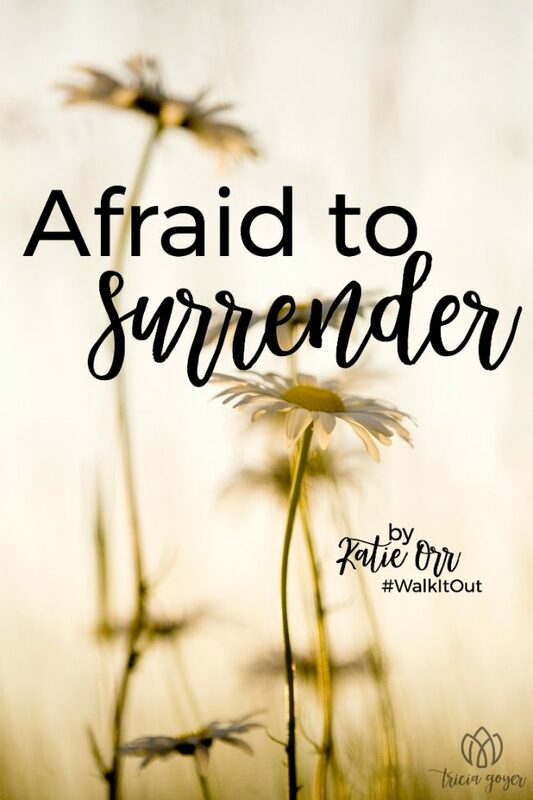 When I first began to entertain the idea of a life surrendered to God, I thought it would be the end of Katie. My social life would cease along with any semblance of fun. It wasn’t that I thought God was a mean and spiteful killjoy; I just didn’t think He really knew and understood who I was, what I loved, and all I aspired to be. In my mind, He was distant and indifferent. Surrender to Him would be an inconvenient interruption — a permanent detour from my plans. SO, WHAT IS CHRISTIANITY ALL ABOUT, REALLY? In the Christian schools I attended growing up, we had weekly chapel. Beyond the typical messages of abstinence, sobriety, and being a light for Jesus, they often challenged us to give our life over to Jesus. This wasn’t salvation-talk. It was a surrender-talk: Give up your plans. Join the mission field. Forsake earthly pleasures and store up treasures in heaven. These words terrified me, as I began to imagine the disappointed eyes of the six-foot mural-face of Jesus and His condemning, pointing finger on the youth room wall. I knew it was what I should do. Surrender was the right answer. But deep down I believed that if I truly surrendered to God I would have to do whatever He told me to do. I was certain that if I did surrender, I would wind up living in a teeny tiny African hut, married to an ugly, boring missionary man. Yet this notion of surrender stuck with me. 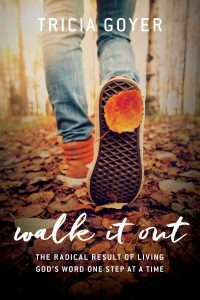 Deep down, I knew that the Christian faith couldn’t just be about the do’s and the don’ts. Why would someone surrender all they have to follow Jesus to hot and dusty Africa . . . just to follow more rules? The life of duty and deprivation couldn’t be what all the fuss is about, could it? There was lingering emptiness in my life. A thirst for more. Every once in awhile, I caught a small glimpse of who God really is and the satisfaction and joy that I might experience through a life lived in relationship with Him. Yet the predominant portrait of God that was being painted by those around me was a distant, strict God who was watching me like a hawk, waiting for me to step out of line so He can catch me in the act. I was afraid of God and ashamed of my imperfection. The image of the count the cost, compassionless Jesus sent me hiding in the shadows. Though I am grateful for the Christian education I received, and all the dedicated church youth-workers who put up with me through those awkward teen years, there was something massive missing in my understanding of who God is and His heart for me. Maybe that teaching was there all along and I was too immature and distracted to see it, but I had not been pointed to see God for who He really is: compassionate, personal, loving, faithful, mighty (And more!). And I didn’t understand the transformation that had occurred years earlier when I entered into a relationship with God through the sacrifice of Christ. Additionally, I was unable to see who I am in Christ — beloved, chosen, treasured, equipped, righteous (and more and more and more) — and why it matters so very much that I understand and embrace these truths. So, instead of running with abandon and joy into His warm and welcoming arms, I hid from surrender and ran far away from His pointing finger. The key to realizing “success” in the Christian life is not in trying harder. Intimacy with God is found as we believe better. When our view of God grows, our actions naturally follow suit. Our desires change. The same list-checking pursuits become a way to worship our precious Savior for whom we’ve grown to become deeply grateful. He is beautiful to us. He is powerful, in-control, and intimately acquainted with our moments. When we focus our efforts on responding to the character of God, becoming partners of His powerful work within us, and understanding the good and grand calling on our life, a true and lasting revolution of our moments occur. I finally did learn the secret to surrender. In fact, I’ve done it a thousand times since. I haven’t moved to Africa to live in a hut (although I would if He called me!) and my husband is a handsome romantic, but my life has taken turns I’d never imagined. My life has been fuller and more fulfilling than I’d ever dreamed. Surrender is indeed a dying to self, a letting go of plans and dreams and control, but what I missed for so long is the fact that we do not surrender to be stripped-down and alone. When we submit to God, He doesn’t take away everything important to us. Yet pursuing intimacy with Him does help us change the definition of important. Yielding to the way of the Bible doesn’t put our life into the hands of a distant, angry God. But it does entrust our souls to the very One who loves us most and the only One who can keep us safe for eternity. Where I saw surrender as a scary proposition, in actuality it’s been the safest proposal I’ve ever accepted. Because the Rock of Ages cannot and will not let me down. 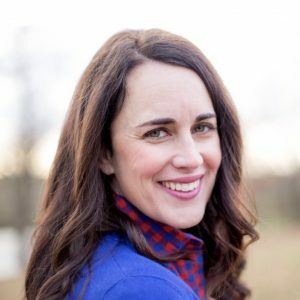 Katie Orr, creator of the FOCUSed15 Bible study method, is passionate about equipping busy women to experience God daily. An enthusiastic and dedicated teacher and speaker, she is a podcaster and prolific writer for blogs, magazines, and Sunday School curriculum. A former Cru (Campus Crusade for Christ) staff member and mother to three young children, she and pastor-husband, Chris, are part of the church revitalization movement.